In the Middle Ages around 1100 -1200 was called Skeppsholmen Wangsö, after "Vang", which means thin. The island consisted largely of bare rock cliffs with little vegetation. In the South there was a particular layer of soil suitable for cultivation and grazing of domestic livestock. The shoreline was considerably higher than today by the elevation of the land that has been going since the last ice age. At the end of the 1500s was called skeppsholmen for "Lust Holmen", and was used as a recreation spot of the first Vasa kings. Gustav Vasa (1496-1560) allowed construction of a garden and Erik XIV (1533-1577) organized celebrations often out on Skeppsholmen. John III (1537-1592) fenced a garden on the island 'south side and built a gazebo in the design and decoration by the architect and artist Willem Boy (1520-1592). In 1634 formed the so-called Admiralty when the naval headquarters were moving out from current Blasieholmen to Skeppsholmen who became Stockholm's naval base. Around the same time as the Navy's shipyards moved to the island the name was changed to its current Skeppsholmen. Skeppsholmens uses as yards and mooring of vessels was due in part to the yard needs more room, but probably mainly due to the Queen Kristina (1626-1689) wanted to riparian areas that could be seen from the castle would look like construction sites, where Blasieholmen with extensive shipbuilding Low center front and center. 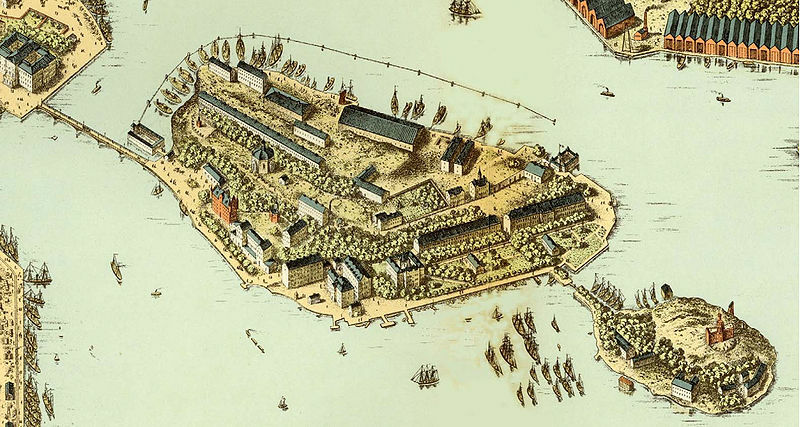 In connection with the war against Denmark the years 1675-1679, known as the Scanian War, it was decided that the naval base would move to the newly founded city of Karlskrona. “Dykdalben” was until the late 1900s mostly by a cluster of pointed, strong logs, arranged in a conical shape with larger diameter down, laid down in the lake, ocean or river bottom sediments and linked together at the top with heavy iron rings above water. The conical arrangement obtained a much higher durability against lateral forces than the same number of logs in a bundle is struck down completely vertical, which is the genius of design. The lateral forces subjected some of the logs to a compressive force downwards and the opposite side of a pull force upwards. The icing in the winter and horizontal movements of the ice creeping up the ice on the “dykdalben” through the angled surface in relation to the ice surface plane and is therefore also better against the big ice pressure, for example ice than the corresponding logs were driven down completely vertically in the ground. “Dykdalben” were also used in ancient times as the foundation for the wooden bridges and as anchoring points for the fleet bridges. Nowadays, the “Dykdalben” are most often made of steel, reinforced concrete or combination thereof.